INFESTATION is the martial industrial act of Louis Carrier. The act is best defined by its burning orchestral textures and its violent percussions that give rhythm and life to combative vocal clamours. Evoking subjects concerning the fight for subsistence of cultural heritage, the project covers the unending determination of the minority French-speaking people of Québec that survives through centuries of assimilation and gives the clear indication that struggling is never vain. The 5th anniversary of War Office Propaganda / Rage In Eden we'd like to celebrate with our classic re-edition. Critically acclaimed martial industrial split "Wunderwaffe" of Cold Fusion and Rukkanor, after first versions V-1 and V-2, this time comes as a V-3 weapon - third (and definitely last) time. 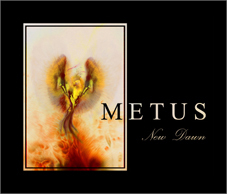 Album contains two unpublished bonus tracks, both from "Wunderwaffe" session, and original, conceptual artwork made by Michal Karcz. Total time 42 minutes, 8 tracks in digipack. Limited to 500 copies. Currently we are moving to new server, it can cause temporary problems with availability to our shop www.rageineden.org. Sorry for the inconvenience! 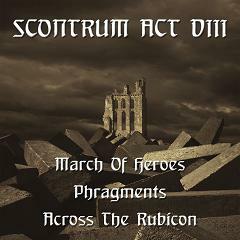 Scontrum act VIII - March of Heroes / Phragments / Across the Rubicon, Rage in Eden Records CDr 2008, lim. 369. The eight part of famous three way split series. Three projects focused on martial industrial music - French March Of Heroes, Slovakian Phragments and Polish Across The Rubicon enriched by participation of Troy Southgate (H.E.R.R. - declamations) and Karol Skrzypiec (IV LAB - grand piano), presents symphonic orchestral, bombastic, neoclassical sounds heavily accented by marching rhythms, lofty sounds of choirs and spoken samples. "New Dawn " is a second part of trilogy. Hope, faith and love..but also pain of imperfection and grief because of our selfishness and ignorance... ...interesting thing is that vocals are totally clear with not any correction or 'tuning'... more attention was devoted to vocals.. very low-pitched mainly but also delicate melodies and strong drums with orchestral hits... no samples were used but all keyboard parts are 'live'... Another great thing for fans of Arcana, This Mortal Coiland Dead Can Dance.